← Investment Mindset Bootcamp. Stop Gambling. Start Accumulating Long Term Wealth. Step 4. This list of extremes seems to add up to a kind of financial “Never Never Land”. Most investors seem unaware of the extent and historic nature of current conditions. Larry Elliot’s quote and article below highlights the risk of getting too giddy. It’s well worth checking out where we currently stand. 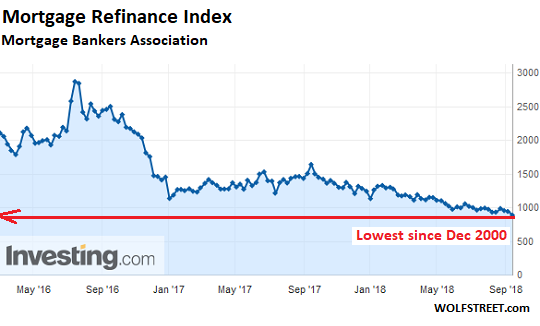 Extreme 1: Mortgage Refinancing has just fallen to the lowest level since December 2001. Clearly higher interest rates are beginning to bite. Also this comes with the first signs of a housing slowdown. Pending home sales are down 2.3% YOY. Despite the stress now being felt in housing, speculative futures open positions have rarely, if ever been more committed to the idea that interest rates would continue to trend higher! Indeed safe haven assets have never been more abandoned in history. Extreme 2: negative speculative short net futures positions in 3 key safe haven assets. 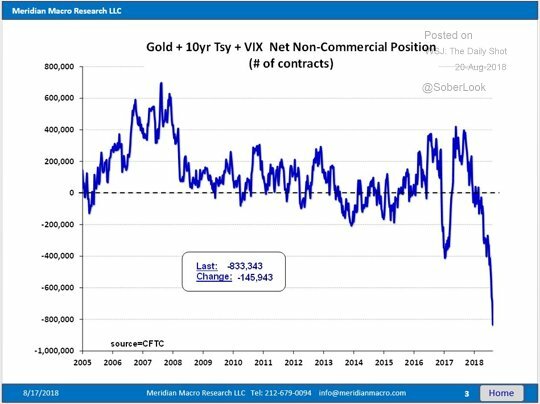 Gold, US Treasuries, and VIX (options hedging vehicle for the S&P 500) are at record levels. These positions reflect extreme views about even higher interest rates, optimism about financial assets (pessimism about gold), and extreme bullishness about US equities, no need for hedging. In combination this suggests that risk management has never been more out of favor by speculators. 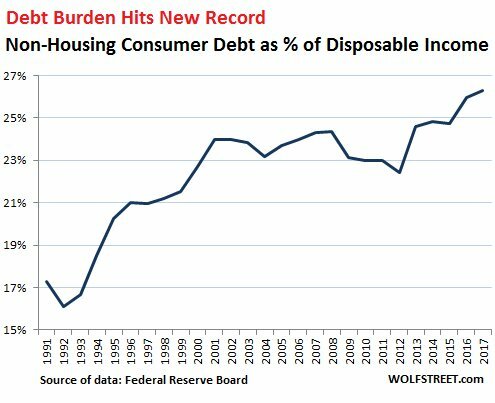 Apparently, there has never been less concern about financing the biggest debt burden in history, which continues to accelerate, even as interest rates are rising! In terms of federal debt, consumer debt, and corporate debt, all of the aggregates have accelerated since 2008 at a rate far above above both inflation and GDP. Extreme 3. Federal Debt has more than doubled since 2008. 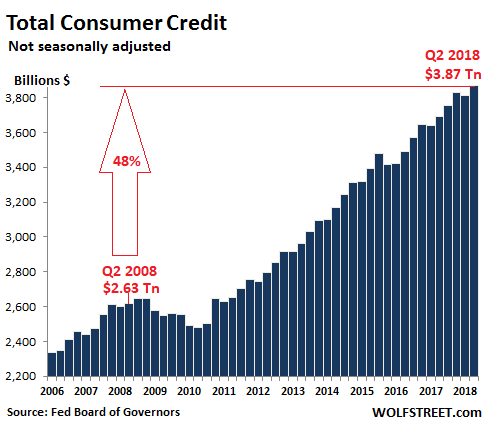 Extreme 4: Outside of mortgages, discussed above, total consumer debt is now 48% above 2008 levels. 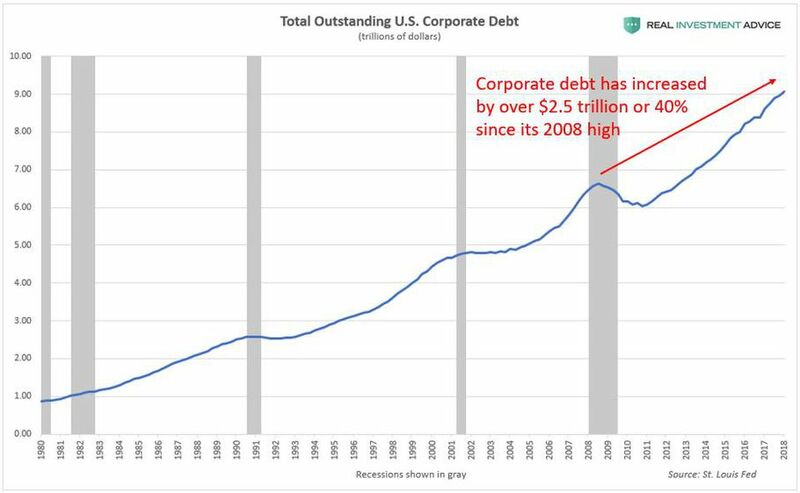 Extreme 5: Corporate debt has increased 40% since 2008. Classically, excessive debt accumulation is not the path to long term prosperity, but clearly it does produce spending that looks like growth so long as debt can grow fast enough. In the US, reserve currency status and record low interest rates have provided an environment where debt can expand at unusually high rates. However, debt can distort perceptions of real underlying conditions. It also means that gains made purely as a consequence of debt are more likely to be transient than durable. 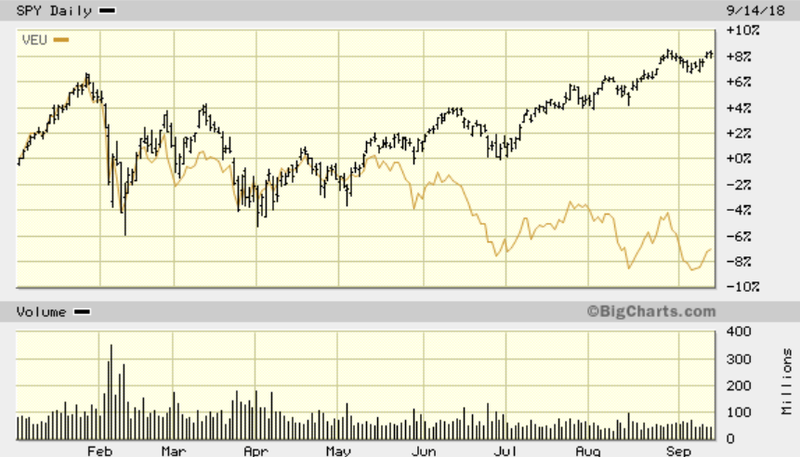 Across the globe the US is demonstrating extreme divergence From the rest of the world. Even though nearly half of SPY earnings are international the divergence with the rest of the world, VEU, has become extreme. 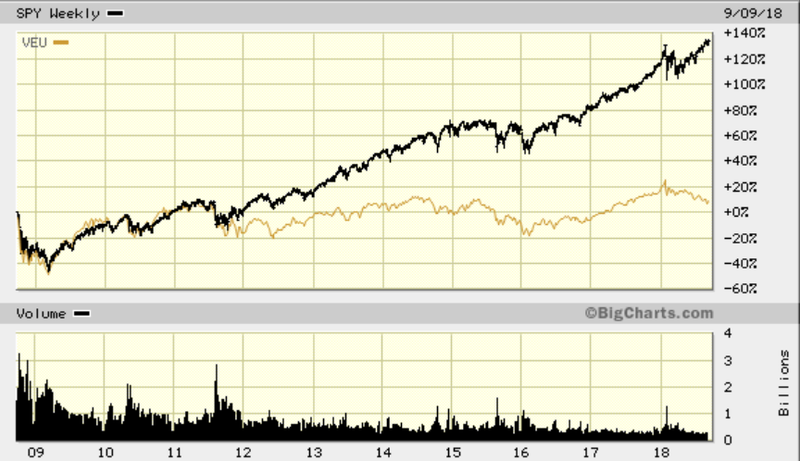 Outperforming by well over 100% since 2012. And by 15% just in the last 4 months! The IMF points out that both world trade, and every other advanced economy, has declining growth in 2018 through 2019, actual or forecast. The IMF has also explained that the US is uniquely expanding debt. 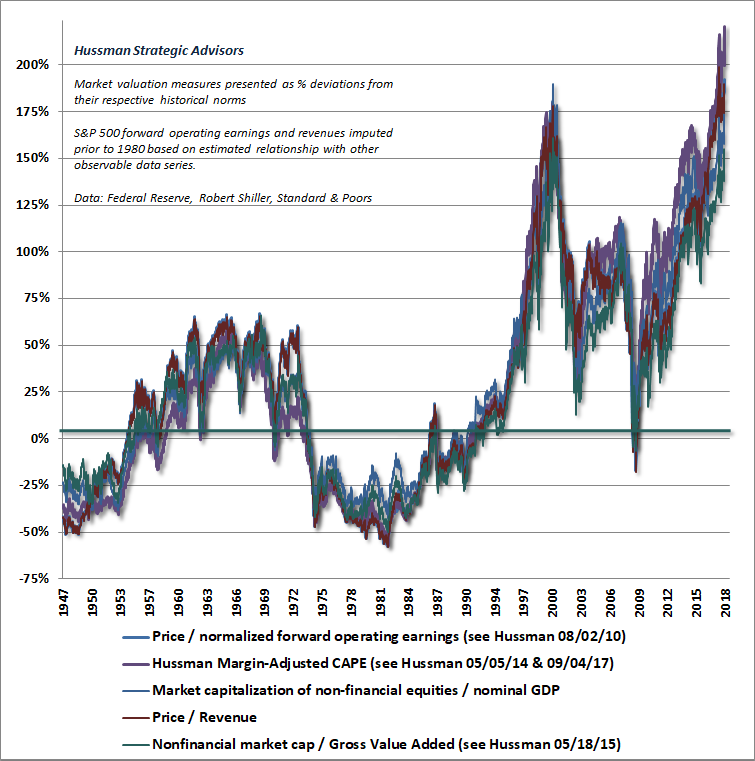 Extreme 9: “Last week, the stock market recorded the most offensive valuation extreme in history” John Hussman. Current valuations are consistent with negative US equity nominal returns over the next 12 years! As is typically required at valuation extremes the level of investment commitment also needs to be at some sort of extreme. 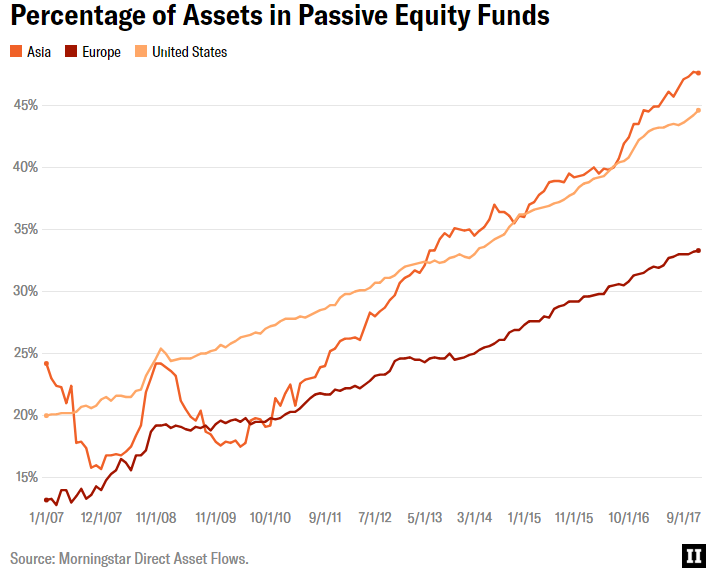 Extreme 10 “Passive Investment” Craze more than doubles in US equities since 2007 to new highs. Interestingly, it seems the central banks themselves, in the guise of the BIS latest annual report, admit to policy failure over the last decade and more. 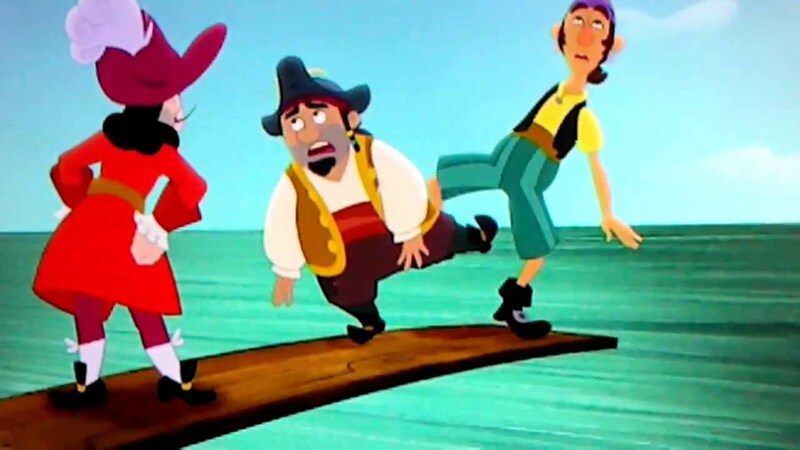 I believe that investors should be very careful. It is important to keep an open mind about the future, and it is interesting to consider the background more deeply. This is an exploratory process with no definitive answers, but in my opinion this interview is certainly thought provoking both in what it reveals as well as how this potential financial predicament may pan out.